From the Ground Up is our feature that dishes the dirt on those more unheard-of fruits and vegetables that we don’t want your taste buds to miss out on! The next vegetable on our ‘From the Ground Up’ feature is Forced Champagne Rhubarb. It’s just your usual rhubarb, except it’s grown using a special technique. It is ‘forced’ to grow in ‘forcing sheds’ much earlier than usual, in the winter. The sheds provide warmth and have restricted light, causing the stalks to be less tart, lighter in colour and more delicate. That’s where their ‘champagne’ name comes from. Rhubarb is quite a unique vegetable that people use when cooking or as an ingredient in baking. The stalks are commonly used in sweet soups, jams, sauces, pies, crumbles and even cocktails! Rhubarb is probably the most sour-tasting vegetable you can find, however as mentioned above, the forceful growing technique of champagne rhubarb allows for a less tart taste. How do you prepare, store and cook it? To prepare: Forced rhubarb is tender enough to not need peeling! You just need to wash the rhubarb, trim the top and bottom of the stalks and slice. To store: Rhubarb can wilt quite quickly so store it in the fridge and consume within a couple of days. Our top tip is to keep the leaves on until you’re about to eat it, as the leaves help to keep the rhubarb fresh. To cook: You can stew or poach forced rhubarb for around 8 minutes or roast it for 15. Rhubarb is most commonly cooked with sugar to sweeten however as forced champagne is slightly less tart, you won’t need as much sugar. Forced champagne is most commonly found earlier on in the year in January or February which is why it’s forced to grow during winter. 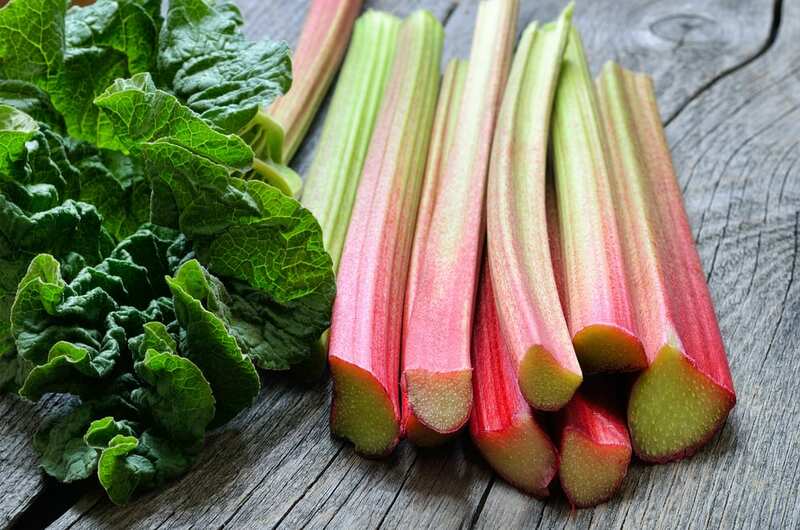 Rhubarb is delicious when used as an ingredient in jam and spread across toast! We also recommend infusing rhubarb into your gin for a refreshingly sweet treat. Add forced champagne rhubarb to your basket today!